SEJONG, Nov. 14 (Yonhap) — South Korea’s jobless rate rose slightly in October due to a fall in employment in the retail and hospitality sectors, with poorer-than-expected job creation showing no signs of a letup, government data showed Wednesday. 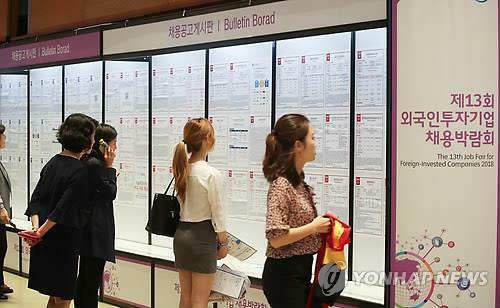 The unemployment rate stood at 3.5 percent last month, up 0.3 percentage point from a year earlier, according to the report compiled by Statistics Korea. The number of employed people reached 27.09 million in October, an increase of 64,000 from the same month in 2017, according to the data. The unemployment rate for young adults — those aged between 15 and 29 — was 8.4 percent, down 0.2 percentage point from the previous year. The employment rate stood at 61.2 percent in October, a 0.2 percentage-point drop from a year earlier, with the corresponding figure for young people at 42.9 percent, up 1.1 percentage points over the cited period. The number of newly added jobs has been in a trough, reaching 45,000 in September, after staying below 10,000 per month in July and August. The retail segment lost 100,000 jobs in October compared with the previous year, marking the largest cut since 2014, and the lodging and restaurant sector shed 97,000 jobs last month. The manufacturing sector also saw a reduction of 45,000 jobs last month. In contrast, the agriculture and construction sectors added 57,000 and 45,000 jobs, respectively. In June, the government cut its job creation target to 180,000 this year from 320,000, but many private think tanks put the number at around 100,000. Since May, the government has been implementing a 3.9 trillion-won (US$3.69 billion) extra budget largely to increase the number of jobs. The push comes as President Moon Jae-in has called for all-out efforts to create quality jobs. Meanwhile, Hong Nam-ki, the finance minister nominee, said he will consider additional measures to improve job conditions. “In addition to unveiled measures, we have to review additional options,” Hong said while on his way to work in Seoul. The finance minister nominee said job creation is the government’s top priority, and more measures may be added to next year’s economic policy plan.